Here at Featherstonewood Primary school, we follow a Maths Mastery approach to teaching. This means spending greater time going into depth about a subject as opposed to racing through the things that all children should know. Previously, racing through content lead to some children having large gaps in subject knowledge because the concept they had just learnt was either too big or learnt too quickly. As a primary school, it is our duty to ensure that children have an absolutely solid, concrete understanding of subject knowledge and skills as well as being emotionally resilient for secondary school. With calculation strategies, children must not simply rote learn procedures but demonstrate their understanding of these procedures through the use of concrete materials and pictorial representations. -No child left behind: all children are enabled to keep up every day. -Understanding real life applications wherever possible to make learning relevant and not abstract; nothing should be taught without a purpose. -Giving children who need it, additional support over shorter, more intense periods, like a day or week. In year one we have been comparing measures. At the beginning of the week we compared the length and height of pencils. We used the maths vocabulary, longest, shortest, tallest, smallest, smaller, taller, longer and shorter. Next we compared the weight of the objects. We looked to find the heaviest fruit and vegetable and the lightest. We compared the fruit and vegetables using lighter, heavier, lightest and heaviest. Next we weighed the fruit and vegetables using balance scales. At the end of the week we compared the speed of racing cars. We explained our learning using fastest, faster, slowest, slower. The year ones had a really fun week! 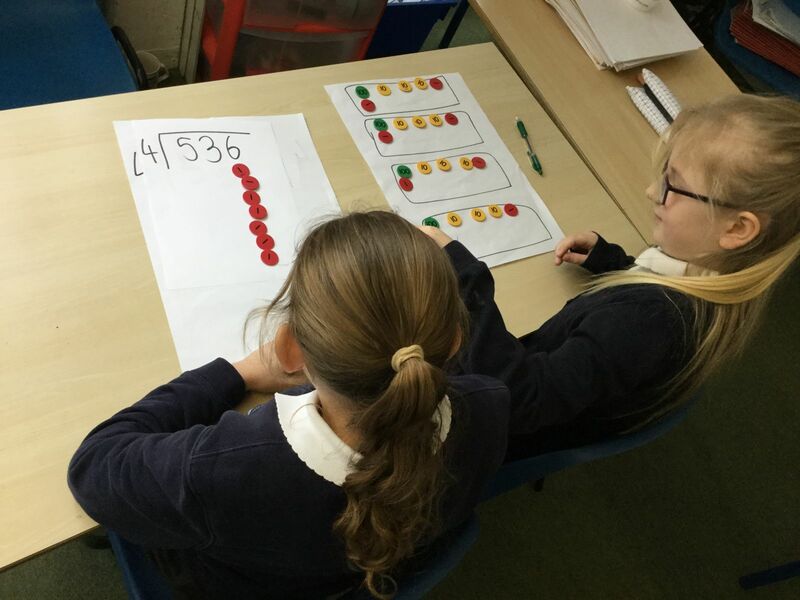 Year 3 have been learning how to regroup tens to ones and also hundreds to tens. We first did this using dienes blocks, then we drew pictures and diagrams. Finally we were able to do it using the column method. In Year 4, last month we looked at measurements. We started the unit by converting between units of time, mass, length and capacity before moving on to estimating, measuring and comparing them or solving problems involving measurements. 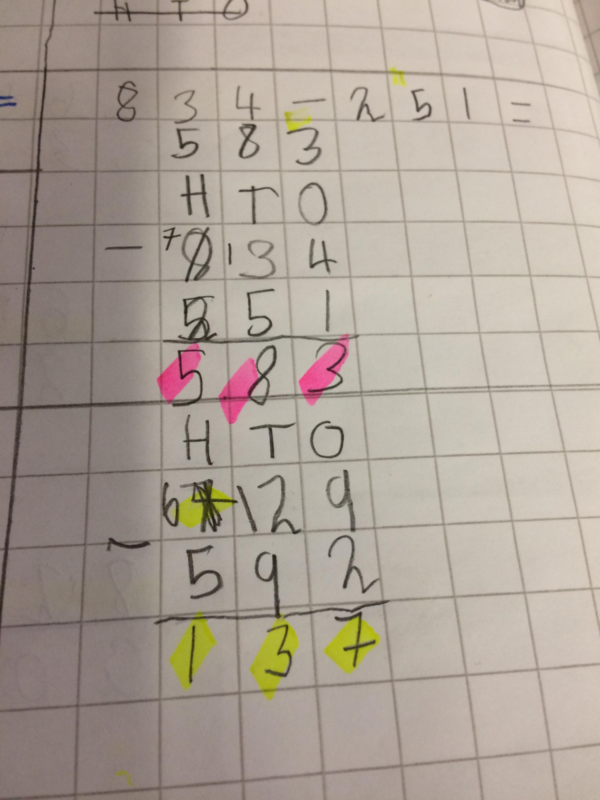 In Year 5, this month we have been looking at sharing and grouping numbers. We started the topic by using the place value counters before moving on to drawing pictorially and then abstract. In Year 6, we have been learning strategies to help us solve calculations more efficiently. We have had to think really carefully about our mathematical language when explaining our reasoning and justifying our answers to others.